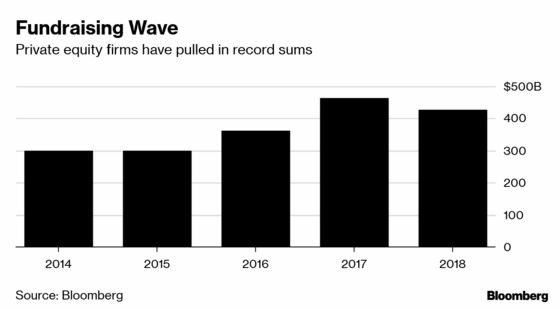 (Bloomberg) -- Blackstone Group LP has raised more than $22 billion for its flagship buyout fund -- making it the largest in the firm’s history -- and it’s not finished raking in cash. New York-based Blackstone completed the first close for its eighth private equity fund last month, according to people with knowledge of the matter. The firm hasn’t yet set a limit for the pool, which it expects to eclipse Apollo’s record $24.7 billion when it wraps up fundraising later this year, said the people. Fundraising in the private equity industry has continued to gain momentum this year with Blackstone alone seeking to bring in $100 billion. Apollo Global Management aims to gather $9 billion for a collection of new funds its starting this year, Bloomberg reported this week. Firms raised a record $566 billion in 2017 and another $432 billion last year. Blackstone, the world’s largest alternative asset manager with $472 billion, raised its largest private equity fund in 2007, when it took in $21.7 billion at the height of the market. The firm’s global private equity business, led by Joseph Baratta since 2012, includes funds that focus specifically on energy and investment in Asia. There’s more than $34 billion ready to deploy. Blackstone’s private equity business has turned its focus to making large deals, like those involving a unit of Thomson Reuters Corp., Germany’s Scout24 AG and Ultimate Software Group. Shares of Blackstone rose 1 percent to $34.98 at 10:11 a.m. in trading in New York. The stock has returned 18 percent this year through April 2. Christine Anderson, a spokeswoman for Blackstone, declined to comment.